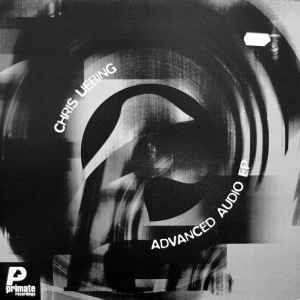 Chris Liebing ‎– Advanced Audio E.P. Percussive loop bassed EP, play and repeat over and over and over and over and over and over and over and over and over.. You get the idea, with maybe some filter changes along the way to give the illusion of build-ups and breakdowns. Overall a boring senseless piece of vinyl, great when mixed not one to leave running for any length of time on its own, the bottom line another quality piece of looping techno from Mr Liebing ;) Old but still a good un! Chris Liebing returns a stronger man, as he is about to enter purple patch. Primate welcome him back with open arms, with his debut still doing plenty of damage on tuned in dance floors. 4 tracks of rocking percussive Techno, with all Liebing's trademark production touches make this the latest in a long of monsters for the UK's home of all things Tech. Guaranteed to cause severe outbreaks of fremzied action whenever applied to a turntable.